Polo can be a rough sport and is certainly a contact sport, so a lot of safety equipment is usually necessary. Most of this protective equipment is compulsory and for the safety of both the person wearing it, their horse and the other players on the field. There is also obviously a good deal of tack for the horse, as with any sport, and also the playing equipment, which every player will need for themselves. Polo players, just as all other riders, must always wear a helmet. Perhaps in polo, more than any other discipline, this is vitally important due to the likelihood of falls. And not only that, but with horses racing around in competition, if you do fall, there is a good chance you could get hit by a horse’s hoof while on the floor. For these reasons, a hard hat is a necessity rather than a recommendation. Always wear a new hat as you never know if an old one has been involved in any collisions – even dropping it on the ground could compromise its ability to protect your head. So never buy second hand and always wear your own rather than a borrowed one. In polo, hats are often coloured with all of one team wearing the same shade. This makes life easy for spectators who want to be able to pick out their team. The horses often wear matching coloured boots too.Apart from a hat, the main other safety equipment a polo player needs is knee pads. Knee pads are very useful to have in a fall, but also if you are banged against by other players – a highly likely occurrence. Players also often wear a face mask and wristbands as protective gear – all useful in such a fast and furious game. 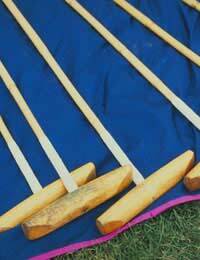 Naturally, a polo player will need special playing equipment. This will include their mallet. The mallet is usually made of bamboo with a rubber grip at the end the player holds. The head is weighted and the heavier the head, the harder it is to use but the better the result. The top players have mallets with heavy heads. The ball is usually plastic, and moves very fast so can still hurt if someone stands in the way of it. And most riders also have a special polo saddle to allow them to adopt the correct seat for the game. When choosing polo equipment, do not forget the horse who works every bit as hard as the player. Most polo ponies wear bandages on their legs to protect them from injury, especially if they accidentally get hit by a mallet. The ponies’ tails are also usually braided to stop it getting caught in the swing of the mallet – painful for the pony but also dangerous for both horse and rider. The amount of equipment needed to play polo is one reason why the cost is so prohibitive to many people. But you should never scrimp on it as it is so important for safety. Colours are also important both for spectators and players to identify their teammates. When you start out, you will be able to borrow or buy second hand a lot of equipment and will gradually build up your kit over the years so do not panic at the thought of buying it all at once.